by Stephen Qualtrough of Liverpool 20th January 2013. 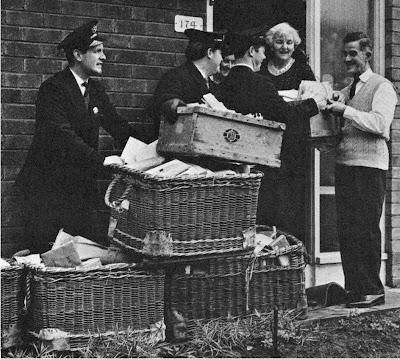 In the Summer of 1963, as one Liverpool pop band replaced another at No 1 in the UK top 10 record charts, we packed our bags and moved to Torrington Drive in Halewood. 'Sweets for My Sweets' by 'The Searchers' was the song that sound-tracked our move at that time. My brother and sister Philip and Diane Qualtrough attended New Hutte School. Unlike them I had graduated to the senior school and went to Grateacre Comprehensive (on the bus). If possible I would take the 78 route to school as it was rumoured that George Harrison of the Beatles lived somewhere along Mackets Lane. I always used to keep an 'eye out' for any signs of the Beatles activity that would pinpoint exactly where it was. There was never any sign of them until……….George had his 21st birthday. Onr morning travelling to school, the day after the Liverpool Echo had mentioned the news, I saw a terraced house covered with graffiti wishing George a happy birthday. So I knew which address it was at last! Had the internet been invented in that day an age I probably could have made a fortune! Little did we know, but John Lennon's 'Mendips' was on the 72 route that we often took on Sunday to visit Calderstones Park, which is sanwiched between John and Paul's former liverpool addresses where, at that time, they lived with their parents. Not long after this we had a knock at the door. My father invited the visitor back for a chat about the family. The man's name was Eric Qualtrough. To our surprise he lived just across the main road not far from where the library was situated in Wood Road. We were invited to tea and met Eric's wife Betty. They were trying for a child. Eric and Betty later adopted a child called Andrew and moved to Yorkshire from Halewood. The house was a semi-detached in the older, more well-heeled section of Halewood. We were new-comers to the area as was the 'overspill' estate as they called such places. In reality we had moved into newly built houses so that work could begin on demolishing some of the very old houses in Everton. There was a lck of amenities on the new estate, apart from a huge public house that was built opposite us. So in 1965 we moved again to the Norris Green/Croxteth over where my mother had relatives. Many of the areas had been standing for over 100 years, and had been subject to heavy bombing during World War 2. 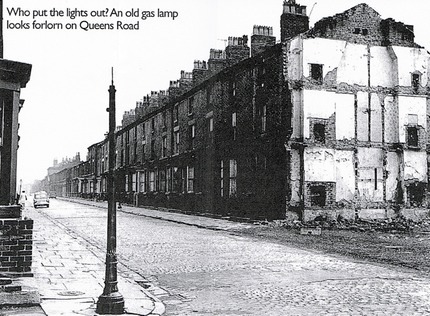 I clearly remember seeing a gap in the houses along Queens Road in Everton, and seeing a bomb site. You could still see the bedroom wallpaper up on the two houses either side of this space. Just near where the picture above was taken was the double-decker bus stop to Seaforth, a small riverside resort. Our parents kitted out us kids in khaki shorts and took us there in summertime. The sky was invariably grey, and the sea, not so bright and blue, but the colour of mop-water; but it made a change to stroll along the pebbled beaches. If you got too near the water, there would be shouts of "Don't go in! The jelly fish will sting you!" There indeed lurked these lethal looking animals - one of the weirdest lifeforms I have ever gazed at, lying in a thick mass at the water's edge to form a sprawling merge and match barrier of pulsating repulsion. But what the heck! We were easily pleased with a sixpenny cone of ice-cream in one hand and a bright red plastic "windmill" in out other one. We thought we were in heaven! A windmill was a folded piece of plastic or in Liverpool language "plazzey" on a stick that rotated when the wind blew! And it excited us! Eat your heart out "Grand Theft Auto" makers. There was a BBC series I enjoyed called "Seaforth" starring the son of Coronation Street, (Ken Barlow) Roach. The son is still acting as Linus Roach. His credits include Batman's murdered father in the first of the trilogy, 'Batman Begins'. I greatly enjoyed Seaforth but it was dropped after only one series. It must have all the nationwide appeal of the real Seaforth, that is none!! If ever anyone wonders why all boys wore khaki shorts well, in those austere days of "make-do" they were recycled from "de-mobbed" army uniforms, so everyone had the same regimented look. And so it went on until the 60's and "flower-power" arrived. But that is a different story (also with Leverpool connections)!